Check Constraint to limit values – SQL Smell? Do Check Constraints Cause an SQL Smell? In his article on SQL Smells, Phil Factor is not in favour of using Check Constraint to limit the values in columns. In my previous post I explained why Phil Factor recommends referential integrity. I am going to explain this apparent contradiction. What are CHECK CONSTRAINTs and what do they do for us? Like REFERENCES, the CHECK CONSTRAINT also says what are values can be stored in a column. The logical expression must be true for the value to be allowed. The logical expression can be limits or even a list of permitted values (as in the illustration). What is the problem with Check Constraints? This sounds like a marvellous idea! The benefit is clear. Constraints will exclude invalid data from the database, even when it is loaded using a utility (eg BULK INSERT). We can define constraints which will protect the database from bad data. So what is the problem? Why does Phil Factor regard this as an SQL Smell? 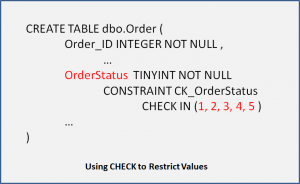 The answer is that using Check Constraints in this way embeds constant values in the structure of the SQL database! The database structure is “locked down” in commercial systems. Only authorised people are allowed to make changes to the structure. Phil Factor wants to avoid these changes. When should we use Check Constraints? This criticism does not mean that we should never use Check Constraints. The ideal constraint will not change in the lifetime of the database. For attributes which represent “classifications” and “types” we should note how many different values we are expecting, and how frequently the allowed values change. Short lists which change very rarely may be acceptable. On the other hand, consider re-designing a CHECK CONSTRAINT as a FOREIGN KEY by adding an additional table to contain the valid values. This has the benefit of making adding a new value a simple data change! Do not use Check Constraints to enforce arbitrary limits. The expected frequency of change. That information will enable us to make an informed decision about how to validate the values of that column. Unfortunately, some of the examples using Check Constraints perform the checks against arbitrary values. These examples will work technically but copying them may cause the problems Phil Factor wants us to avoid. 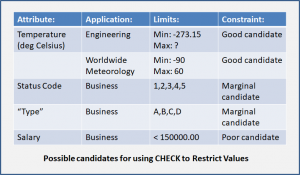 Check Constraints provide a way of validating data values. They are appropriate for checking against values which do not change. For lists, lookup-tables with Foreign Key Constraints may be better. Do not use Check Constraints against arbitrary values or values which change frequently. The next article covers “Indexes”. I will explain how an Analyst can influence some design decisions. Author Tom GilliesPosted on 2018-06-07 2017-10-06 Categories 2018, Code Smells, Requirements Smells, SQLTags Code Smells, Database Design, SQL, SQL SmellsLeave a comment on Check Constraint to limit values – SQL Smell? 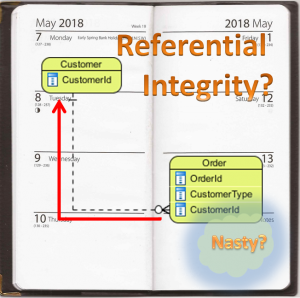 Not using Referential Integrity – An SQL Smell! 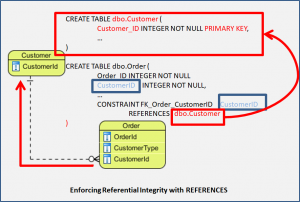 Not Using Referential Integrity – SQL Smell? In his article on SQL Smells, Phil Factor describes identifies two “smells” associated with Constraints in SQL. He regards not using Referential Integrity as an SQL Smell. In this post I will explain what a Constraint is, and how one kind of Constraint provides Referential Integrity. 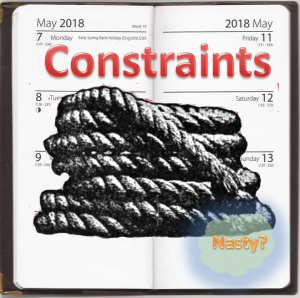 What are CONSTRAINTs and what do they do for us? A Constraint limits the values which are allowed in a column. The SQL database manager will use constraints to validate data. There are several types of constraint. Phil Factor thinks that not enforcing Referential Integrity is usually bad (and I agree). The FOREIGN KEY REFERENCES constraint on a column makes it a Foreign Key to another table. The Foreign Key must be present as a Primary Key in the referenced table. This is called Referential Integrity. In the illustration, it is not possible for the Order table to contain a CustomerID which does not exist in the table Customer. This is very powerful. The constraint makes the database manager check every change. Statements which would violate the Foreign Key constraint are rejected. Performing the validation costs effort. Phil Factor points out an additional benefit. The database manager may be able to use the Foreign Keys to improve performance of some queries. Why wouldn’t you use Referential Integrity? A desire to minimise the “load” on the database manager. Dirty Data: An “upstream” system may provide data which violates the constraint. Accepting this argument may mean importing faulty data, and the associated problems into your system! “Staging tables” may be a better solution to this problem. How are you going to perform the validation? Which system components are going to perform the validation? Do you expect the alternative solution to perform better? Will the alternative solution be better in some way? Not having answers to these questions is not really acceptable. Try and make a rational decision, based on numbers. The Conceptual Data Model identifies business entities and relationships. Those relationships define the referential integrity requirements. The system is going to validate the data in some other way. Foreign Key Constraints exclude some invalid data from the system. Orphaned records (eg non-existent Customers) are impossible. Exceptions to this rule require a rational justification. In the next article I will look at “Check Constraints” which are a different way of ensuring valid data. Author Tom GilliesPosted on 2018-05-07 2017-10-04 Categories 2018, Code Smells, Data, May, Model, SQLTags 2018, Code Smells, Data, May, Model, SQLLeave a comment on Not using Referential Integrity – An SQL Smell!